Linda Thomas-Greenfield, a member of the Career Foreign Service, has served as the Assistant Secretary for the Bureau of African Affairs since 2013. Prior to this appointment, she served as Director General of the Foreign Service and Director of Human Resources (2012-2013). 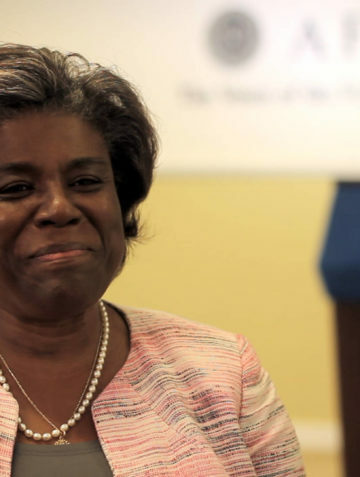 Thomas-Greenfield’s 34-year Foreign Service career includes an ambassadorship to Liberia (2008-20120), and foreign postings in Switzerland (at the U.S. Mission to the United Nations), Pakistan, Kenya, The Gambia, Nigeria, and Jamaica. In addition to the Bureau of Human Resources, her Washington postings include the Bureau of African Affairs (2006-2008) where she served as Principal Deputy Assistant Secretary, and the Bureau of Population, Refugees and Migration (2004-2006) where she served as Deputy Assistant Secretary.